If we talk about the actual facts, then definitely Gurgaon Best Location for investment retains many promising reasons because of which today, Gurgaon is marked as one of the best locations for property investment. Why Choose Gurgaon as my Location? Around about 500 companies which include reputed MNC’s, IT, BPOs, big four audit firms- Deloitte, Ernst & Young, KPMG and PwC. Biggest entertainment hub with DLF Cyber Hub, DAMDAMA, Blue-O, Appu Ghar Amusement Park, Ambience mall and more. Get ultimate facilities like Health cares like Columbia Asia, Max Hospital, Medanta Medicity, Apollo The Cradle etc. Reputed & popular Schools such as DAV Public School, KR Mangalam World School, Euro International School and GD Goenka Public School. National Highway 8, Dwarka Expressway, Mehrauli-Gurgaon Road, Sohna Road, Gurgaon, Golf Course Extension Road, Golf Course Road, etc retrench the travelling time to cover the distance smoothly. The existence of metro and rapid metro both have outlined the rapid travelling in and around Gurgaon. Today greenery lots immense importance and here Aravalli Range Mountain, bountiful greenery, open space and rocky ridges add extravagant freshness to the location. Mobility is not a problem, metro, wide roads, fastest cab service, city buses, auto rickshaws and more gives a convenience travelling to every individual. Today Gurgaon comes with top level residential projects that are crammed with jaw dropping facilities like pool, spa, sport area, jogging track, international level security system, yoga space, clubhouse, high green zone area inside the project for eco friendly ambience, proper car parking space, all time power and water back up and party hall, in fact, more facilities can be easily seen in Gurgaon’s property. Top Indian Real Estate Builders like DLF LTD, Godrej Properties, Sobha LTD, EMAAR India, Tata Housing, Tata Value homes and more have their best units to bring new developments in order to boost the real estate industry and bring some optimistic changes that customers have been looking from so long. Every sector of Gurgaon is developed so that its local people get comfort and now every project comes with the right security system, so no need to fret. If these bullets are not enough to sway you, then you will be happy to know that there many more advantages that make Gurgaon the lucrative destination for property investment. Furthermore, what is there to know? Experience is unexplainable here because the Godrej Properties has assimilated every mind in the best way possible to let its residents get an experience that is beyond expectations. As Godrej Meridien is situated at a prime location in Gurgaon, so it promises high return over investment, gets your family a home they always deserve. Ready to move property is considered as the first choice of home buyers because they want a ready to move property so that there is no wait for possession and they get what they see, I mean no false promises. As it is clear to that this property comes with immense greenery that means creates an eco friendly ambience for healthy lifestyle forever. Everything at EMAAR Gurgaon Greens is planned with an intelligent approach to reach the next level of home space for the grand lifestyle that retains you standard forever because you deserve more and better. 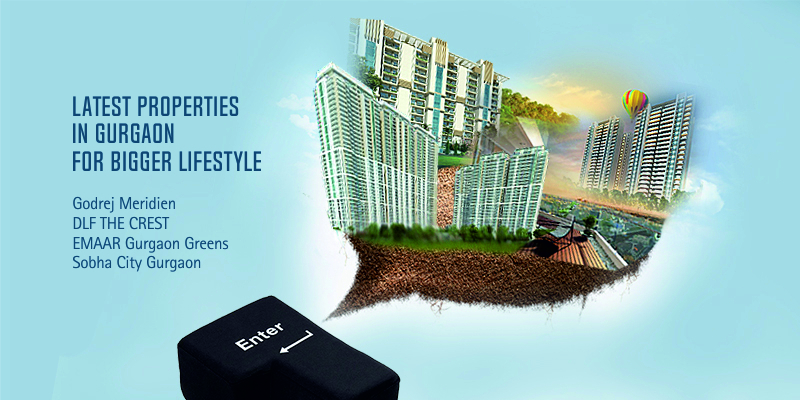 It has great location, attractive apartment, green zone area, ample amenities and prime security system and more, so in toto, if you consider Sobha City Gurgaon for your personal address, then you will never repent because every single thing here is planned in the right way, so that it can outline every feature and every need in its interesting way. Last and importance, the comparison is really hard between these projects because every project has its own appearance and importance where it revs up for lifestyle. I have rounded up the best projects that come with its own USPs because otherwise if you will search you will countless properties by many more builders, but these impressive addresses hold reasons to bring brimming comfort, luxury and satisfaction.